Whether you’re on a Whole30, eating paleo, or are just living a healthier lifestyle, chicken is always such a great go-to protein. It’s easy to source, it’s filling, and it’s fairly easy to make. The only problem is that it can get a little bit boring… especially if you’re just having plain chicken breast. I’ve wasted way too many years of my life eating boneless skinless chicken breast only seasoned with salt and pepper to settle for boring chicken anymore! 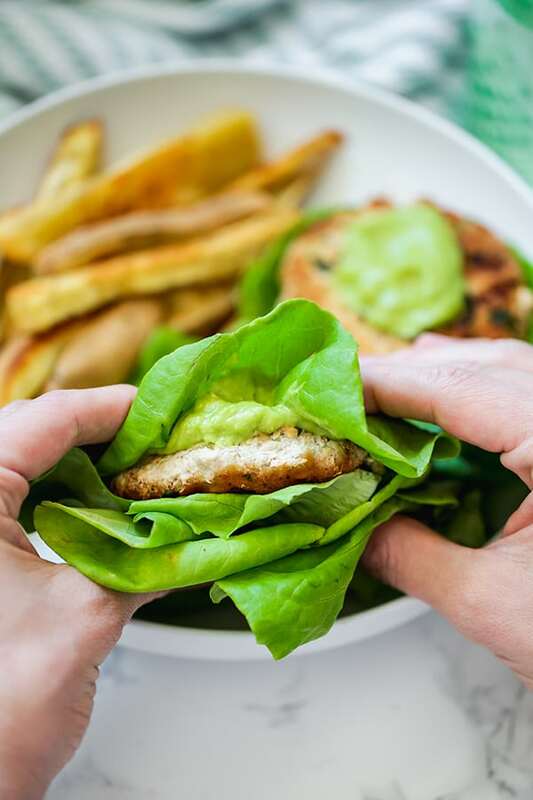 That’s why I’m loving these Whole30 Spinach Avocado Chicken Burgers! 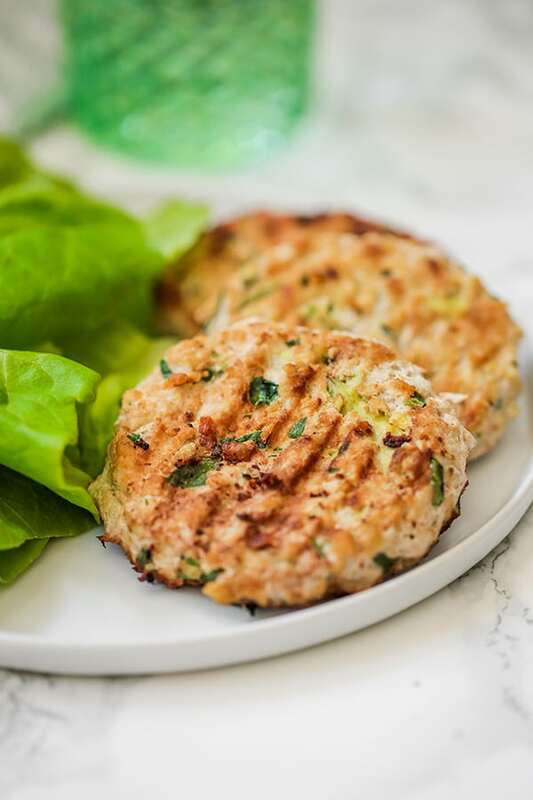 These chicken burgers are perfect for when you’re craving something other than a beef burger and want some more flavor than just straight up chicken breast. These taste great on their own, or you can make a yummy avocado mayo to up the avocado factor. Because, who doesn’t need more avocado, right? The avocado mayo is totally optional, but it’s super easy to make with ingredients that you’ll already have on hand to make these burgers. Plus, you can use it in other recipes as well, like my avocado chicken salad. 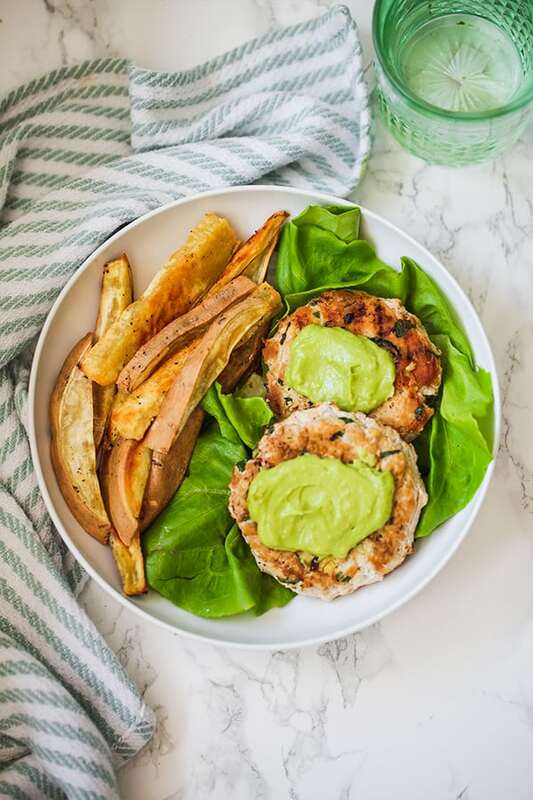 You can these burgers on their own and pair them with some sweet potato fries, make them into a burger bowl, or turn it into a sandwich with a bun of your choice like some simple butter lettuce. You’ll use avocado in the burger, as well as for the optional avocado mayo. Spinach is the perfect veggie to hide in this burger. It has a neutral flavor but packs a big nutrient punch. This acts a binder in the burger. Technically, you could use other flours like almond flour if you tolerate nuts, or you could experiment with leaving it out. Lime adds a tiny zest to the burger to add more flavor. You can use other seasonings in the burger as well. Very gently fold in the avocado slices, being careful to not smash them. Form the chicken into 4-5 burgers, spacing out the avocado to make sure it’s evenly dispersed. 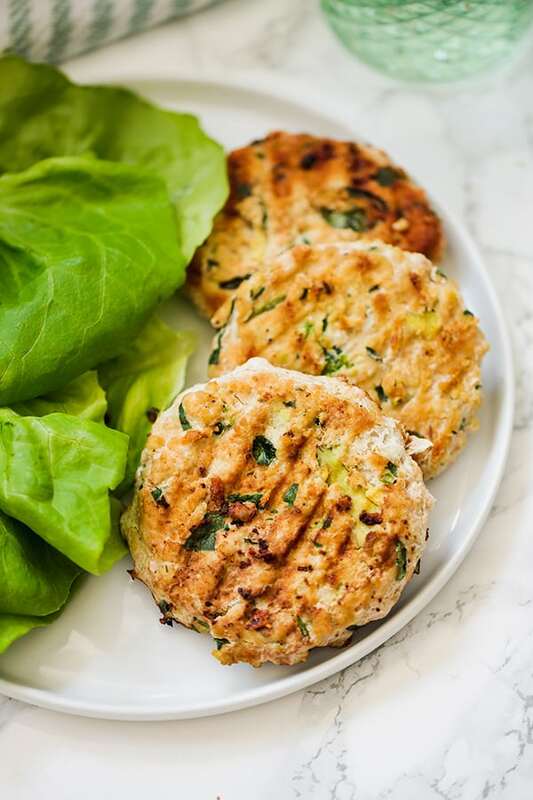 Grill the burgers on the grill surface (using extra avocado oil if frying in a pan) for about 5 minutes on each side, or until internal temperature reaches 165 F.
Top with optional avocado mayo and serve in lettuce cups like a bun, or enjoy the burgers on their own. Yes, the chicken is raw. I’ve never commented on a recipe before, but since this one is new & has no comments yet, I felt compelled to share my thoughts. Living in south Florida, I always have avocados & limes on hand & always look for new ways to use them. I was so excited when this recipe popped up on my Pinterest feed. It was sooo delicious. I had some issues with moisture & keeping it together on the grill, so I think next time I will use the coconut flour & grease my grill a little better. It was surprisingly easy to throw together too! I got 3 bun sized patties & 2 mini patties out of the recipe. We ate them with the avocado mayo on tostone (fried plantain) buns with sweet potato fries. I only cooked 2, because I wasn’t sure how they’d turn out & I froze the rest because avocados oxidate very quickly. This recipe will be added to my regular rotation! I’d also like to share that I defrosted one for lunch today, it held up very well & was just as tasty! Yum!! Thank you so much!!! These were delicious! I fried mine in a cast iron pan with lots of coconut oil and they turned out amazing. Thank you for this quick and easy recipe! Thank you so so much Candace!! So glad you liked it! You won’t get the same grill marks and you may need more oil, but it should still work. Let me know if it works well! I just made these yesterday, but I used turkey instead of chicken. It’s what I had on hand. They were good. I really liked the addition of the avocado mayo. I will be making these again, adding some spice to them. Yum! I can’t wait to try this! It has such simple delicious flavors! Thanks for sharing! I bet this chicken burger could be used with a variety of toppings! 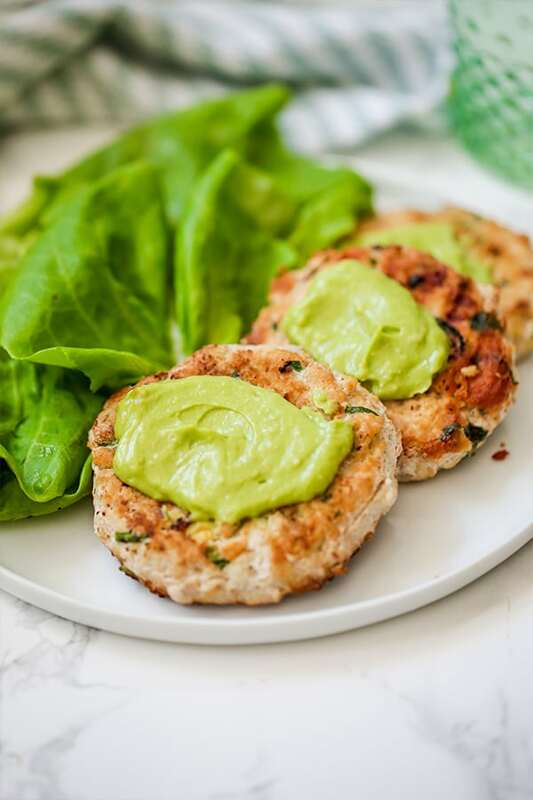 I made this with ground turkey and they were amazing, especially with the avocado mayo! That really put the flair over the top. Yay! Thank you so much Beth!! I wasn’t sure what to expect in terms of texture given the chunks of avocado but we loved these burgers! I doubled the garlic powder and added a bit of cumin and they had great flavor. I didn’t make the avocado sauce but may try that next time because I will definitely be making them again! Hey Michelle, I’m trying to figure out what fries you’ve pictured with the burgers. They look delicious! Are they white sweets or parsnips? They’re white sweets 🙂 I believe these were Hannah Sweet Potatoes. I love the recipe and so does my 2.5 year old! Do these freeze well? Any tips of defrosting? I don’t normally freeze meals but would love to be able to make double the amount and freeze half. Looking to change up my Whole 30 recipes and this one was perfect! The avocado keeps it moist and the flavor is great! Yum! Thank you so much, Courtney! So glad you liked it!!! Great flavor and easy to make! Will definitely keep this recipe! Soooo delicious! Thanks for yet another fabulous recipe! Thank you so much, Grace! So glad you liked it! !